I think most of us would be familiar with at least one company that marketed direct to consumers in their homes. Examples are Avon cosmetics, Longaberger baskets, and Fuller brushes. In most cases the salespersons were (are, as some of these are still in business) not employees of the company, but were private contractors who took orders for a commission. 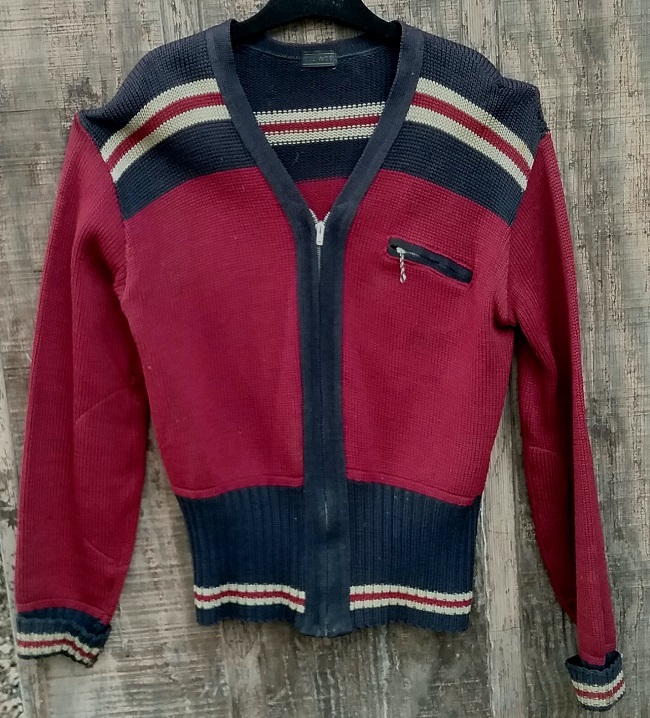 There were also several companies that sold clothing. 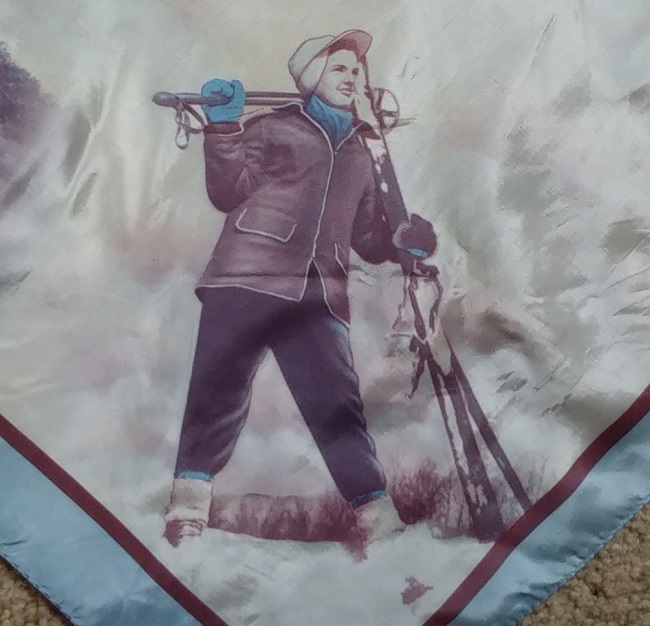 One was Doncaster, who first used members of the Junior League as their “fashion consultants”. Doncaster recently closed after eighty-seven years. 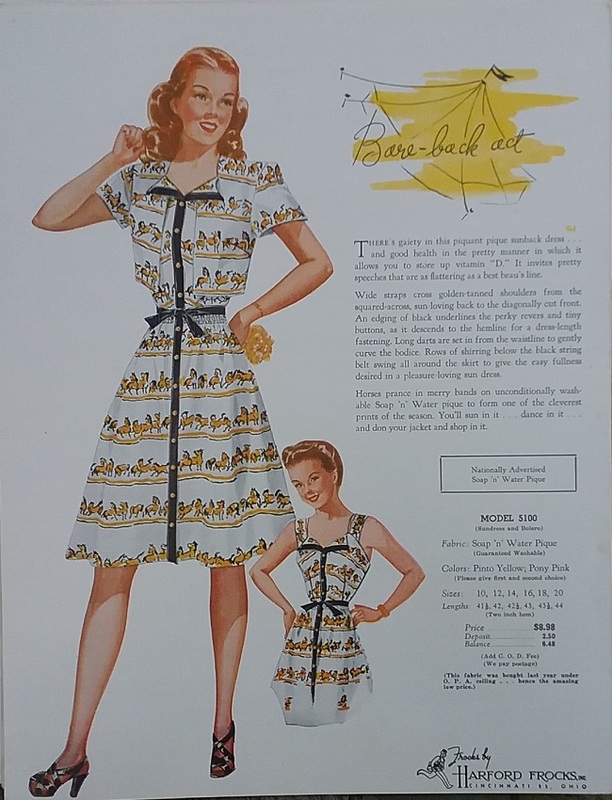 Another fashion company that used direst sales was Harford Frocks of Cincinnati. 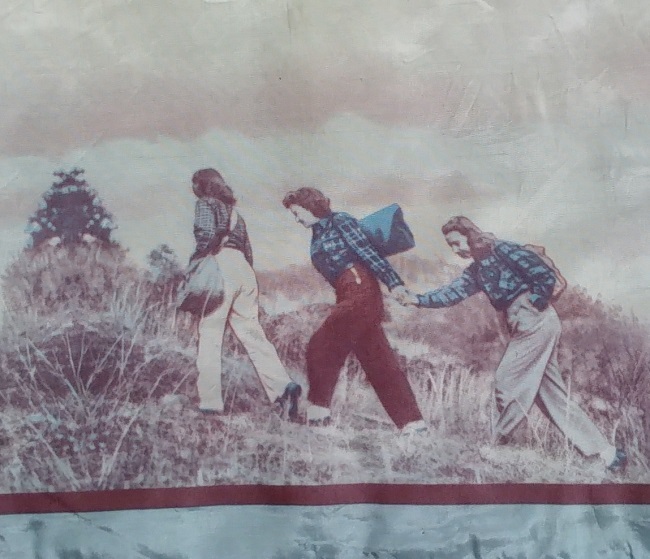 Consultants were usually women, especially homemakers who wanted to make a little extra money. Each consultant had a sales kit that included cards showing all the available styles. 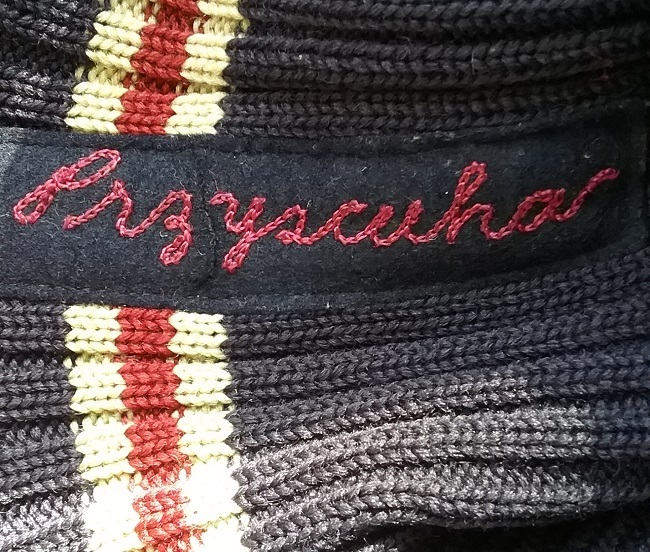 The best part was the attached fabric swatch on each card, allowing the customer to actually feel the fabric. I haven’t spent a lot of time researching the company so I can’t give a complete history of the company. The president was Clarence Israel, who arrived in Cincinnati in the early 1930s. His papers are held by the American Jewish Archives, but there is probably not much about his time at Harford. His more important work was as a social activist, and he worked to benefit the Jewish community of Cincinnati. There are several interesting tidbits I want to share, however. I couldn’t find any firm dates for when Harford was in business, but the best source for trying to figure it out was Pinterest. Lots of cards are on view there, with the earliest ones dating to the mid 1920s, and the latest to the mid 1960s. 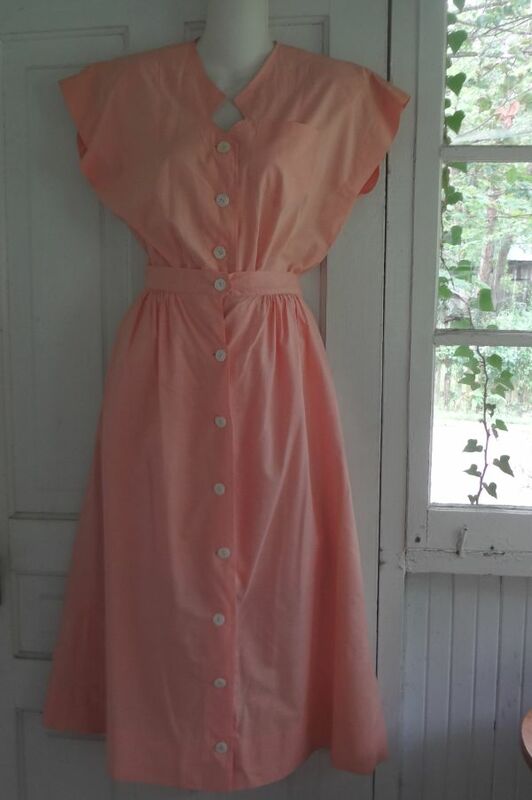 The company advertised in cheap magazines and comics, and according to the ads, the consultant got a free dress for every three she sold. I also found ads in the want ads section of Popular Mechanics. The company was located in what is today the American Sign Museum. In 1937 the Ohio flooded, and the building was damaged. They sued their insurance company because it would not pay for damages. The insurance company won the case. I have thirty-seven cards, but they are double-sided. They are not dated, but the designs look to be 1946 ish to me. 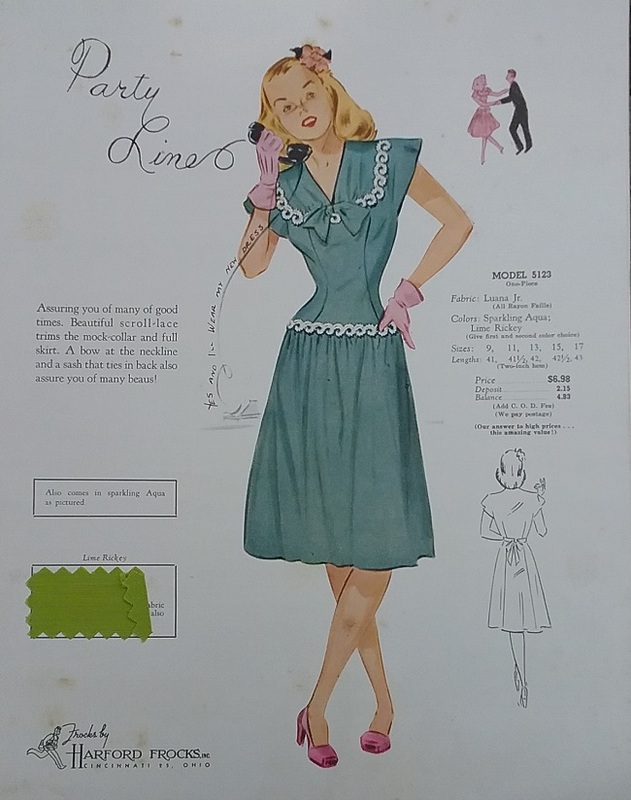 There are all kinds of garments, including socks for men and “Curve Curbers” (aka girdles). There are suits for women and a few designs for little girls. But by far the best represented garment is the frock. 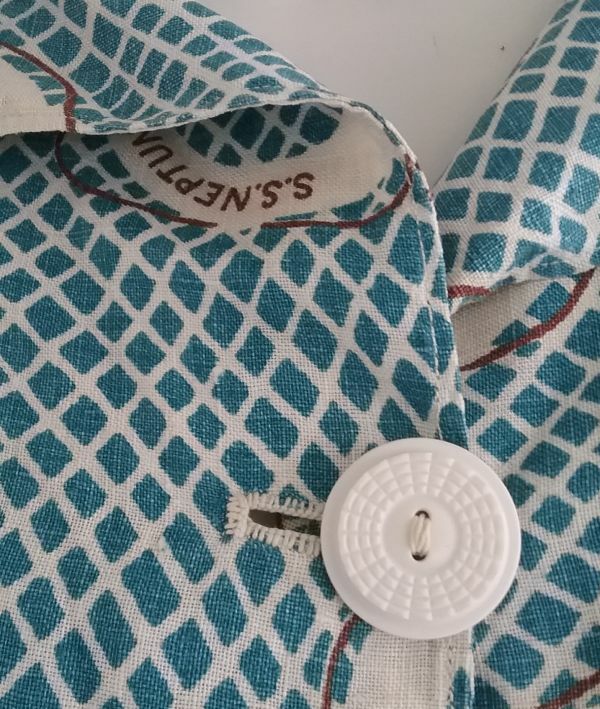 Each design has a fabric swatch or two, and included are the sizes available. They had three size ranges, what we would today call juniors, misses and half sizes. Some of the designs went up to a 44 inch bust. 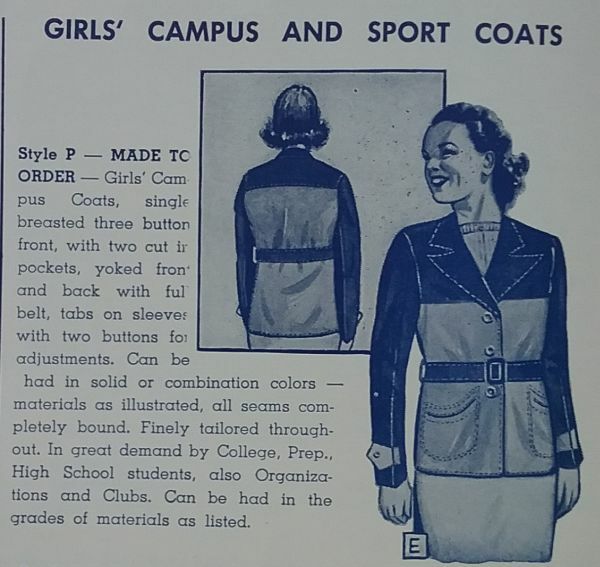 The designs marketed to the teen market often had novelty features, like the pockets above. 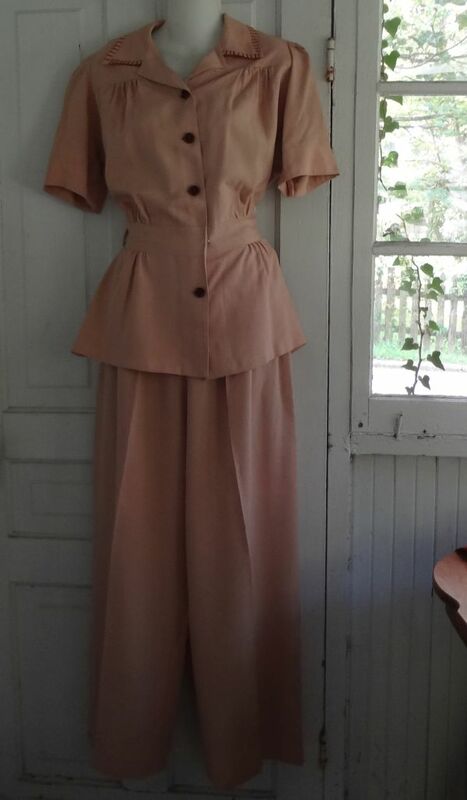 This two piece dress looks like it has Schiaparelli-inspired buttons, but look closer and you’ll see that the buttons are round, and the top of the notes are embroidered onto the jacket. Noticeably absent are pants. These shorts were the only pants in the entire set, though I have no way of knowing if some cards, which may include pants suits, are missing. There were several sundresses with jackets. 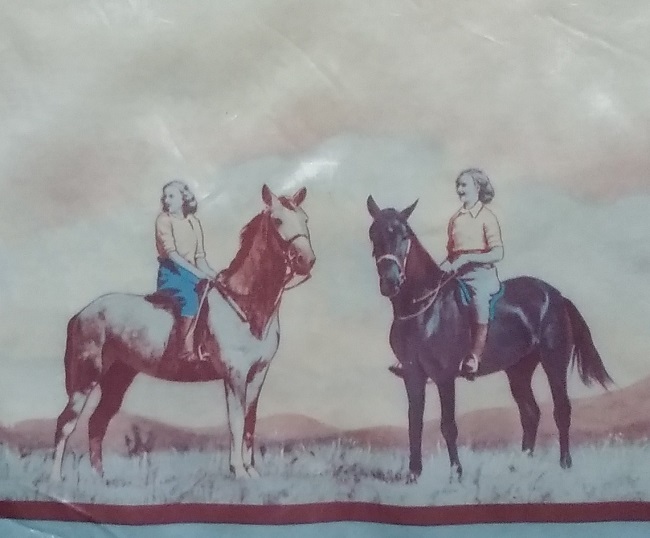 The horse fabric is a printed pique. This is a versatile set, but it would be even more so if a pair of shorts were included. 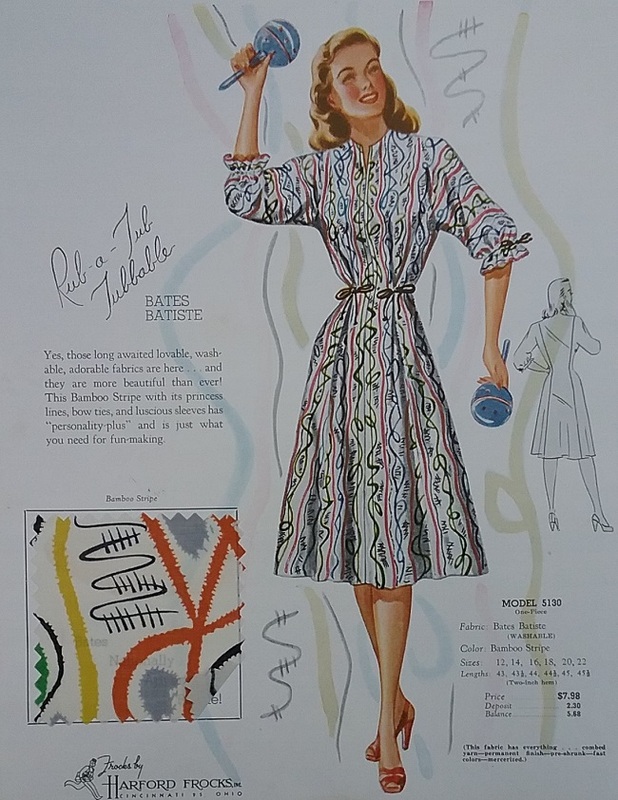 One of the best things about post-World War Two fashion was the return of lots of color. Note that even the shoes are a bright, cherry color. 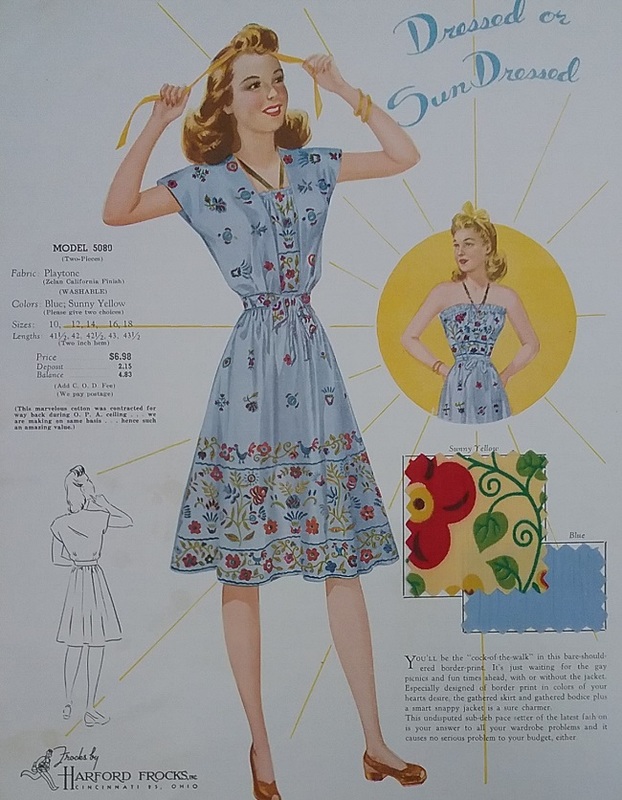 Like so much of the clothing advertising in the first six decades of the twentieth century, the fabric was up front and featured. 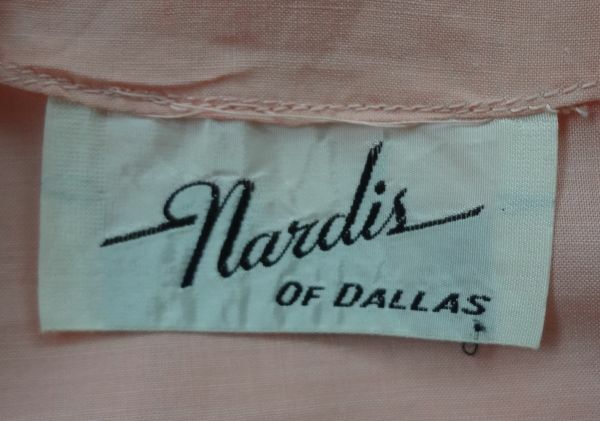 Bates was a well-known brand of textiles, and Harford was quick to point out the connection. I recently found this pair of wedge heeled shoes on eBay, and was really delighted when they arrived in my mailbox. I don’t buy a lot of shoes for my collection for various reasons, and I’m quite cautious when I find a pair I might want to add to my collection. These more than met my strict criteria. Condition is a big problem with vintage sporty shoes. It’s fairly easy to find superb examples of evening shoes that date back to the early days of the twentieth century, but comfortable day shoes were often worn until they were done for. This pair looks like they just came out of the shoe box, circa 1947. How did I arrive at that date? First, I could be off a year or so in either direction. 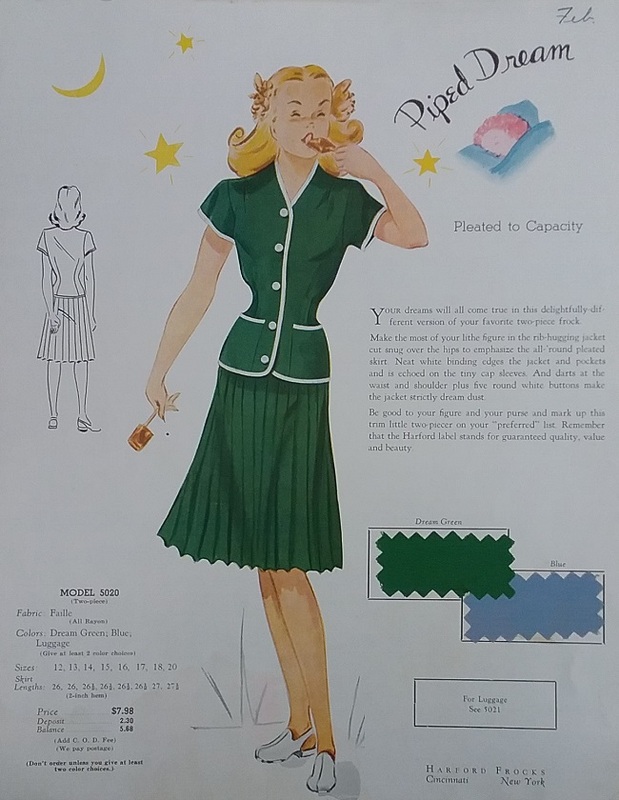 I have spent considerable time engaged in research involving 1940s and early 1950s fashion magazines. To me it’s really interesting to follow a trend from its first appearances in advertisements, to the days, often years later, when the trend becomes a has-been. Wedge heels first appeared in 1936 in Italy with designer Salvatore Ferragamo, though they didn’t really catch on until WWII made practical heels more necessary. They continued after the war ended, into the early 1950s. In trying to date my shoes I looked for two things: ads from the Vitality Shoe Company, and wedges that have a curved, rather than a flat sole. 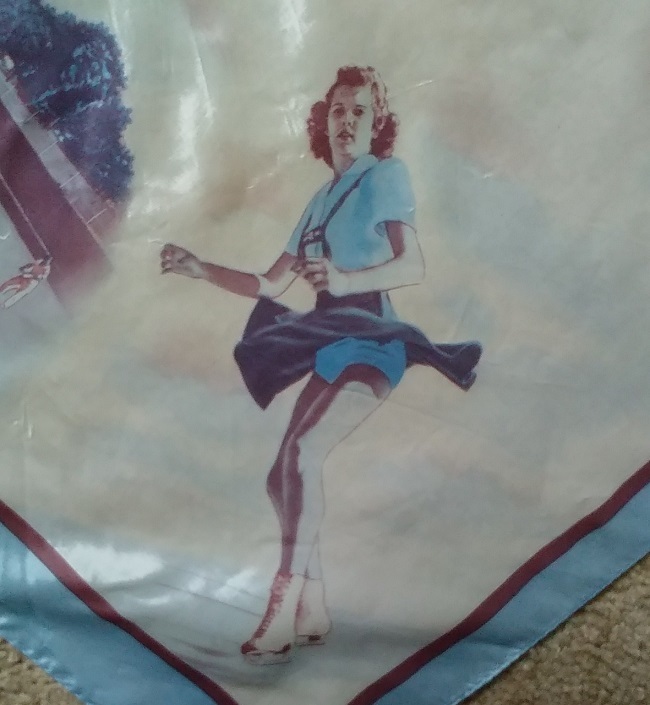 From 1945 through 1954, I found only one ad from Vitality. 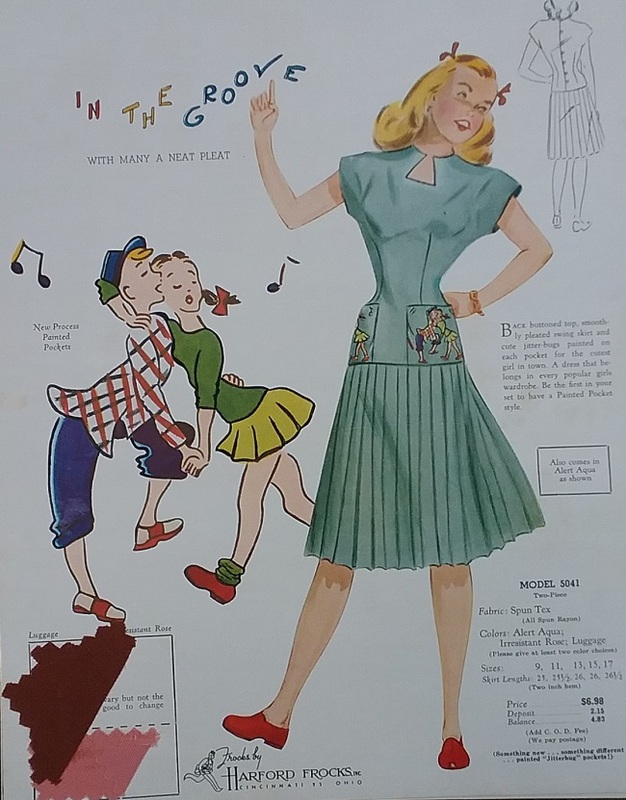 This ad is from 1949 and it features three styles of wedge heels. Note that the pair on the bottom left has a slimmer and higher wedge. I noticed this happening around 1947, and by 1954 the old thick clunky-look wedge was gone. 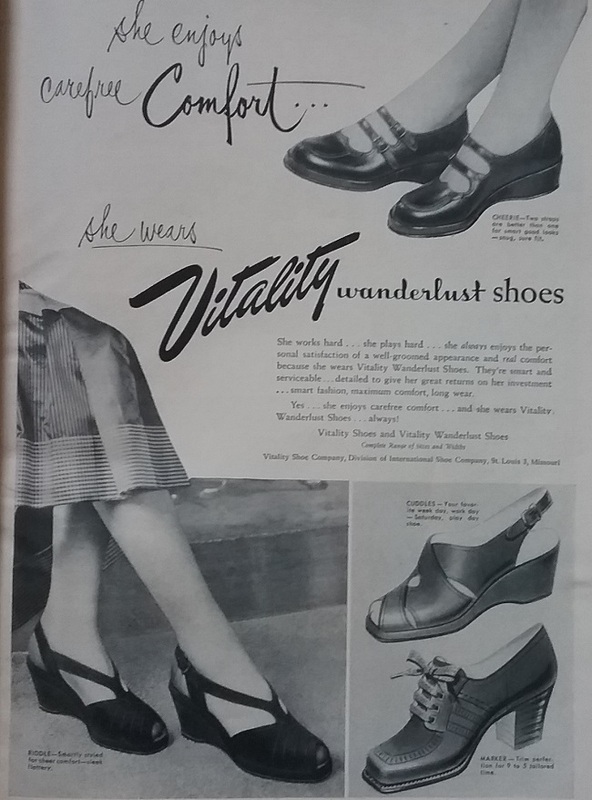 Note also that Vitality calls these walking shoes the Wanderlust line. My thinking is that this line replaced the Open Road line. The last ad I found on-line for Open Road was 1946. 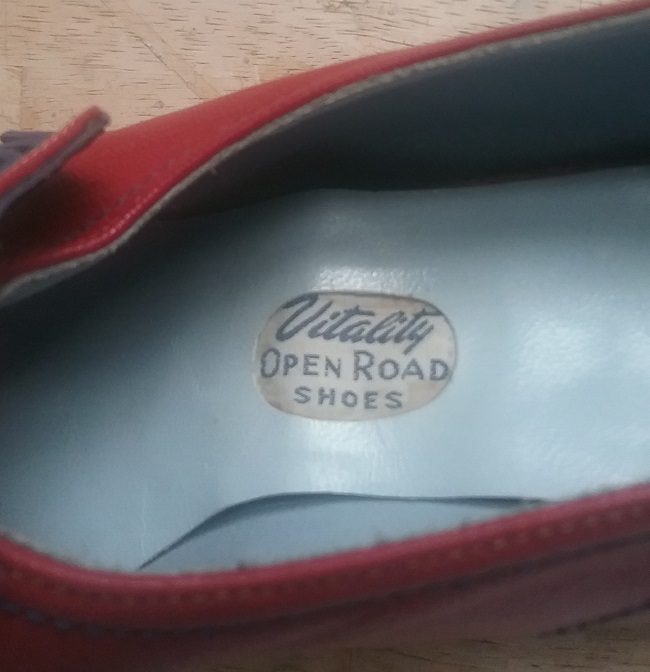 Vitality was part of the International Shoe Company of Saint Louis. At one time it was recognized to be the largest maker of shoes in the world. They made average price range shoes, so it is interesting to see how very well-made my shoes are. 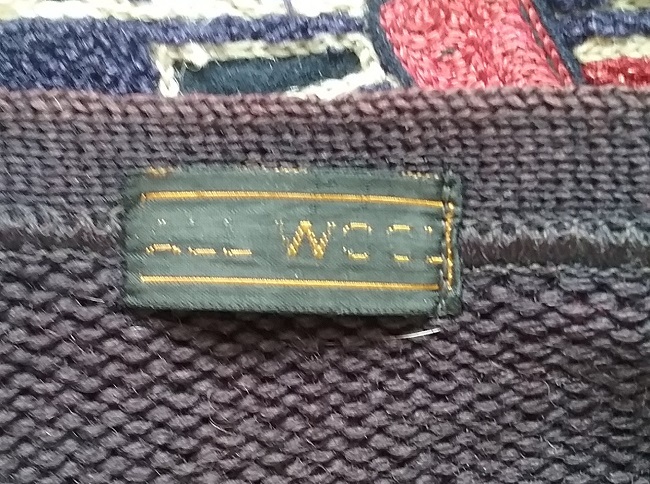 I love the way there is a woven label inserted under the insole. That feature pretty much ended with the 1940s. During WWII, shoe colors were strictly limited because the dyes used for leather contained ingredients needed for the war effort. I have read there were six colors allowed, but a Smithsonian article says there were only four: black, white, brown, and russet. 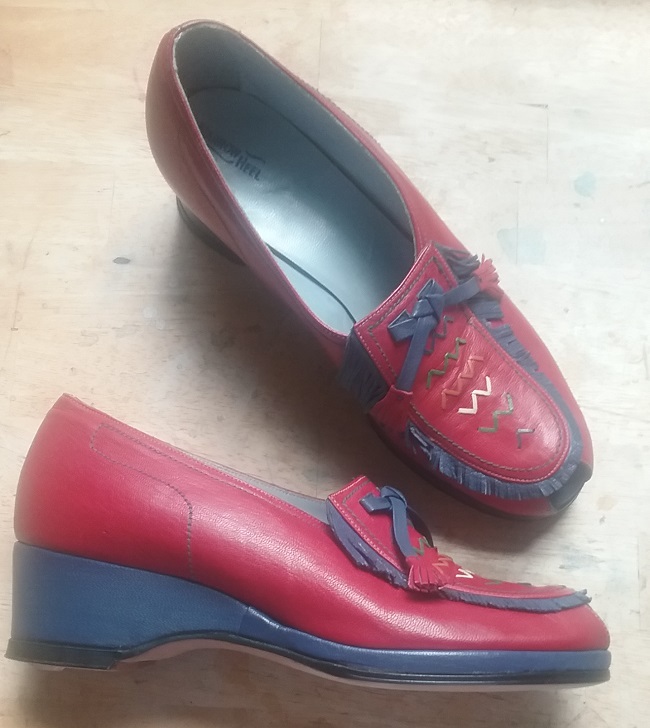 At any rate, these shoes could not have been made during the war years with the beautiful red and blue, and the trim of even more colors. In my research, I noted that by the beginning of 1946, American consumers were once again able to buy colorful shoes. After the war ended there was an increasing interest in style from the American West. 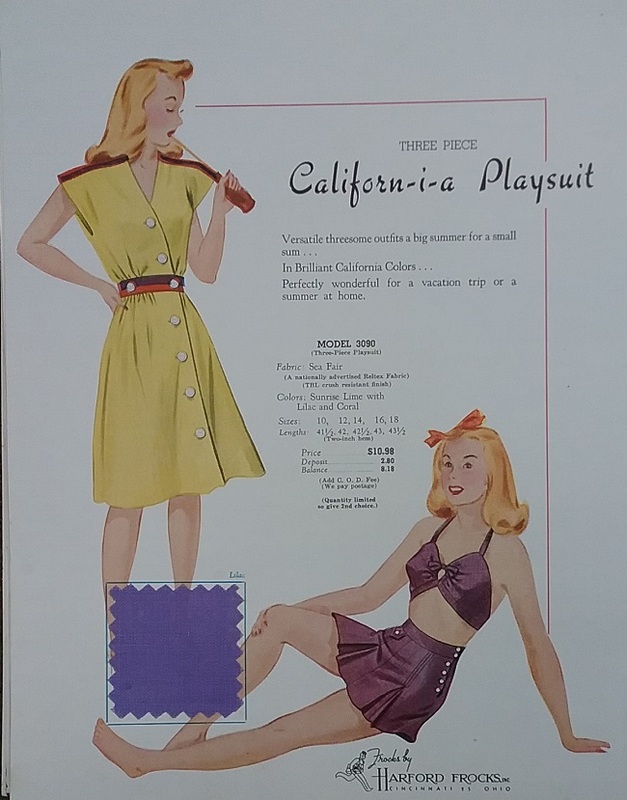 Many service men and women and defense workers had enjoyed the “California lifestyle” during the war, and the Westernwear of Hollywood actors must have also played a part. 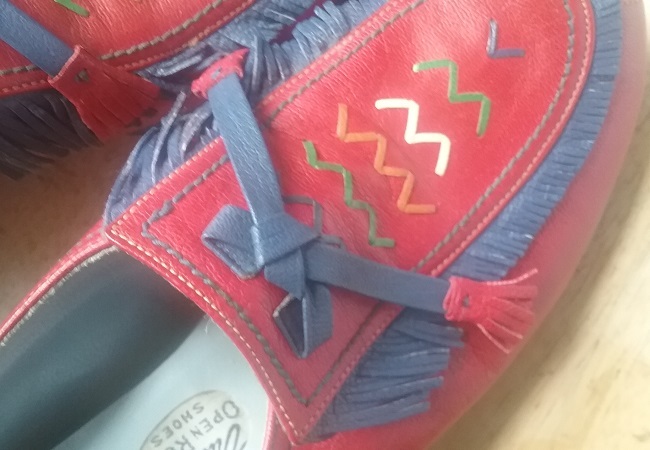 I can’t help but think that in today’s world, a cry of “cultural appropriation” might be raised against my moccasin/wedgie hybrids. 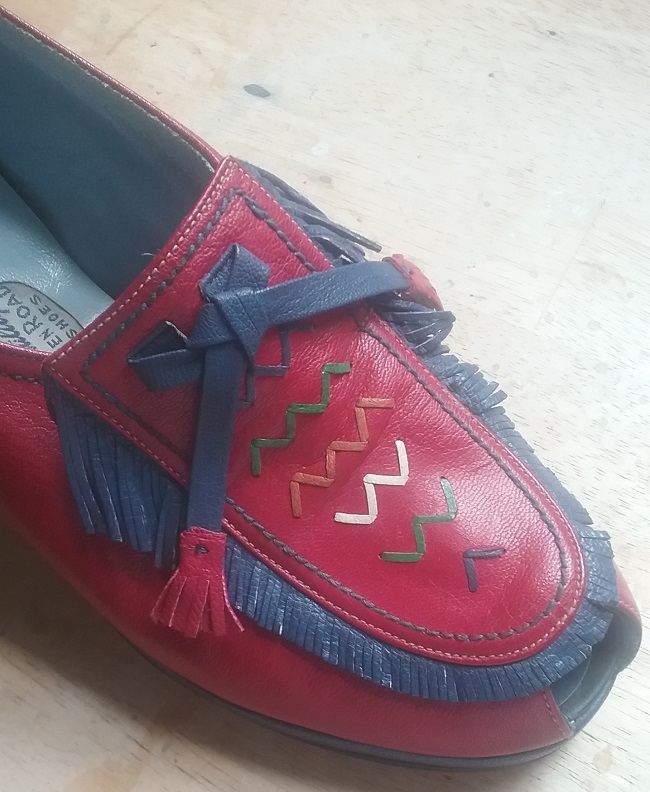 With their colorful but vaguely Native or Southwestern vibe, I can see how they could have been just the shoes for women who were ready to wear color again. 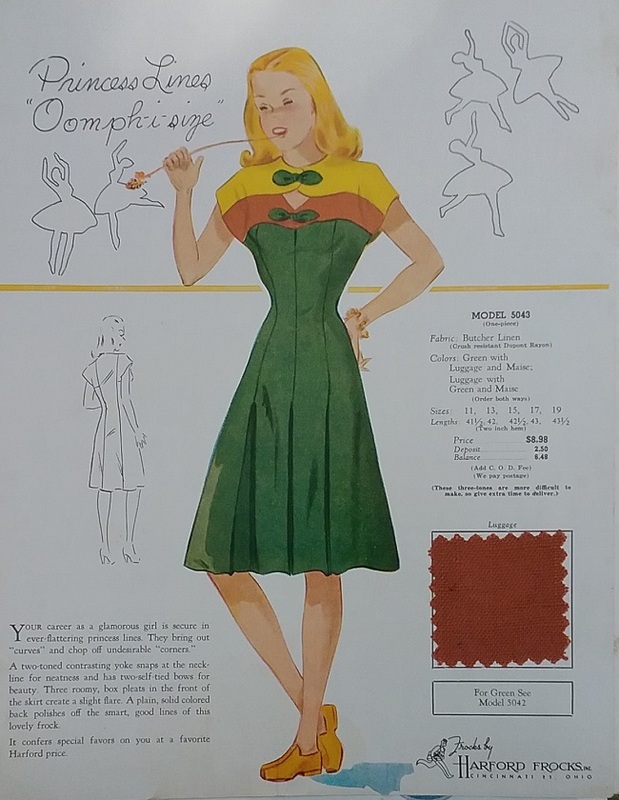 Empire Sporting Goods, Spring & Summer 1942 Catalog. 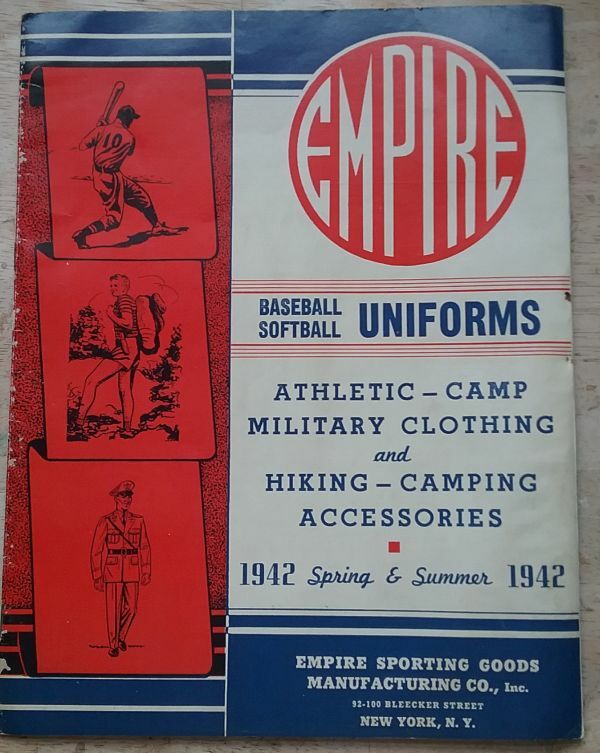 I added this 1942 Empire catalog to my collection for several reasons. First, I have an Empire piece in my collection, and I wanted documentation for it. 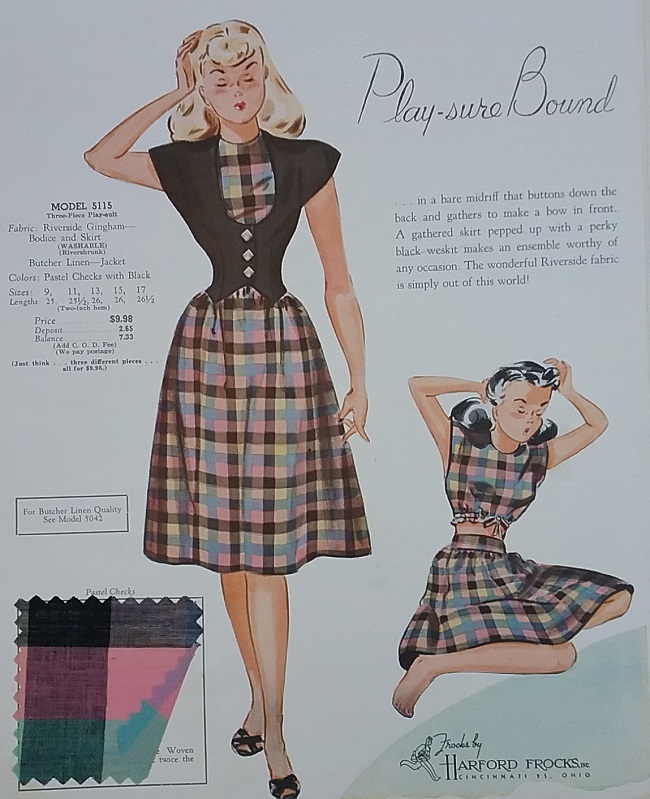 But I was also interested to see how women’s sports clothing, especially softball uniforms were marketed in the very earliest days of WWII. 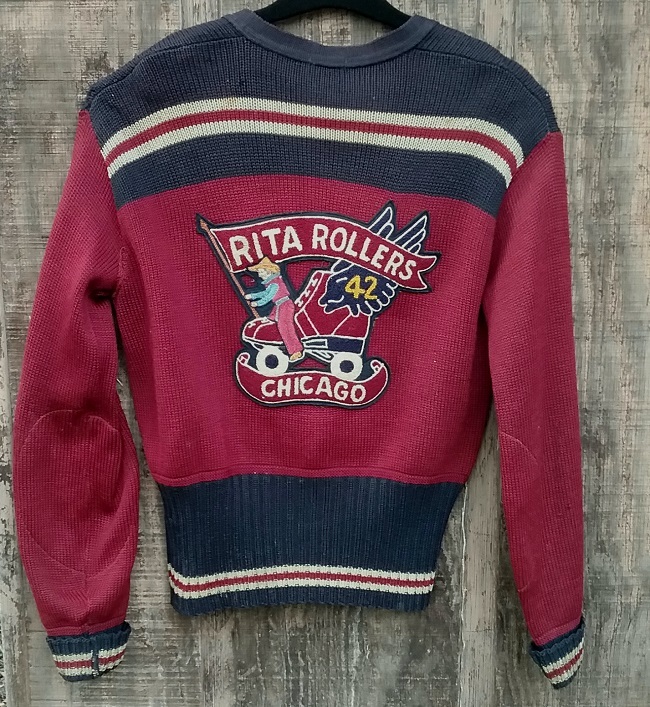 This was a full year before the formation of the All-American Girls Professional Baseball League that we all know of from the movie A League of Their Own. Before 1943, women were expected to play softball rather than baseball (something that for the most part is true today). 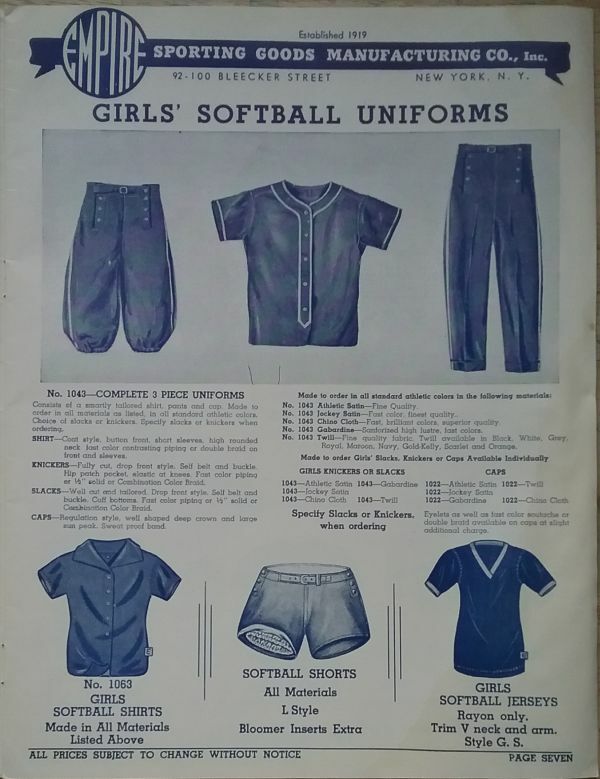 As you can see from this page, the softball uniforms were very much like traditional baseball uniforms worn by boys and men. If you have seen A League of Their Own, you know that the women in that league did not wear traditional baseball uniforms. 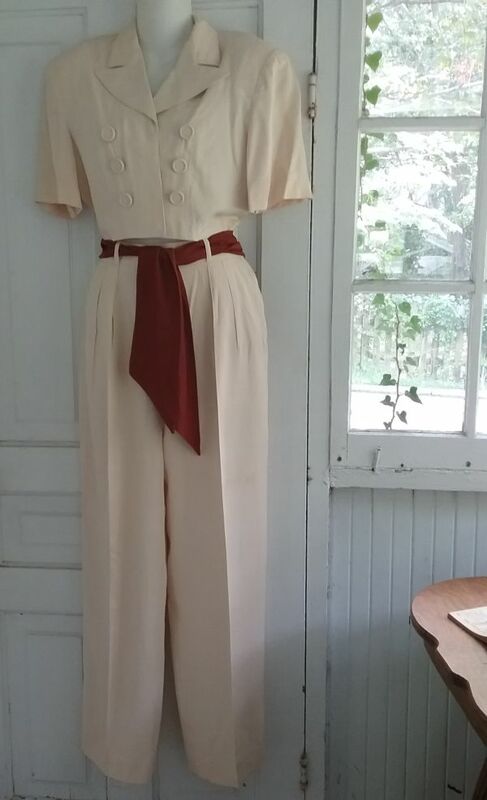 The Smithsonian has one of the women’s baseball uniforms that belonged to Betsy Jochum, a player for the South Bend Blue Sox. I want, no I need, one of these uniforms in my life. 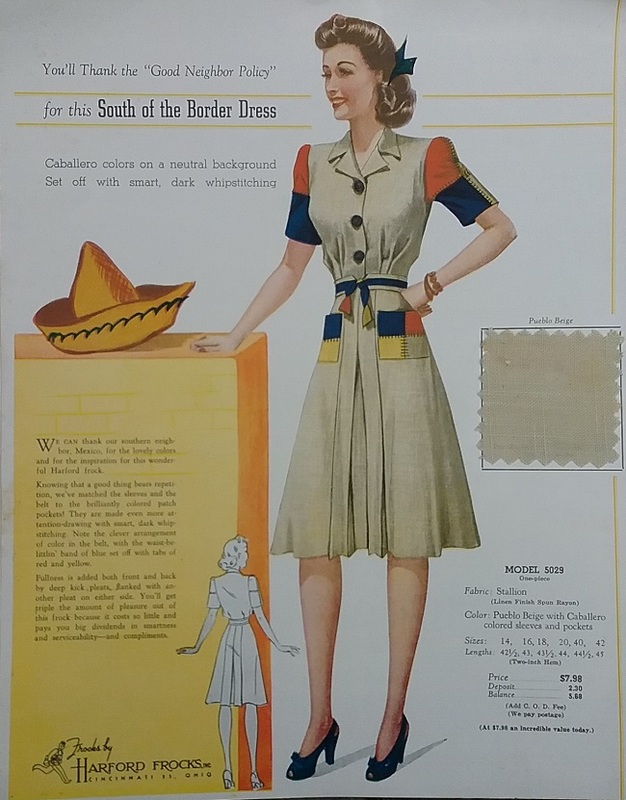 Looking through this catalog, it’s interesting to see how subtly fashion appears in the clothing. 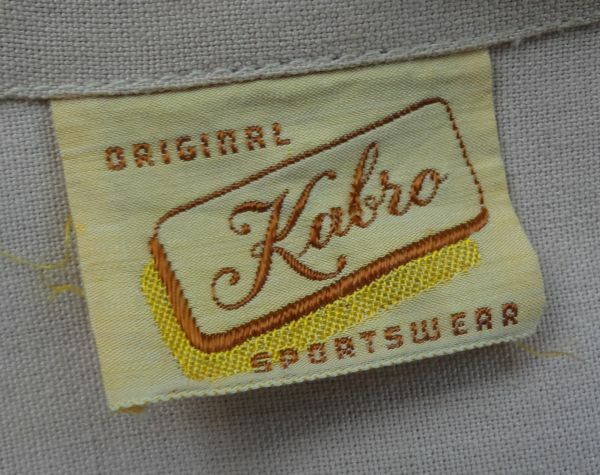 Often sports clothing is not thought of as being fashionable at all, but fashion is reflected in even an object as mundane as basketball shorts. Remember the good old days when Tom Selleck wore his shorts very short on Magnum, P.I.? It was the same on basketball courts across the country. When shorts lengthened and became baggy in the 1990s, the change was also seen in basketball uniforms. 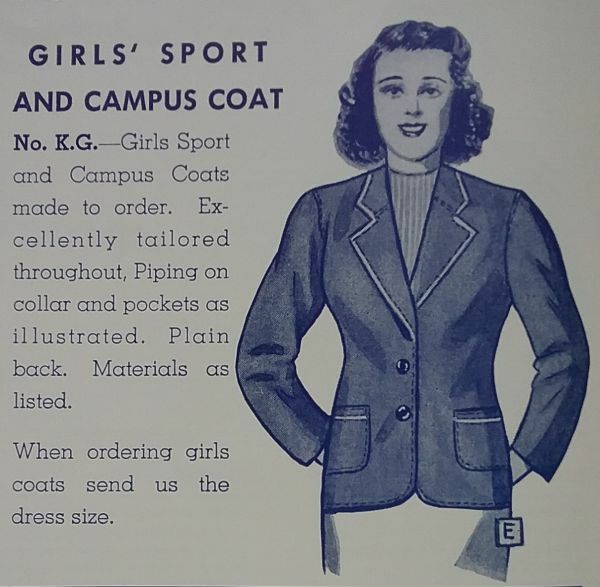 In addition to the active sportswear, Empire also offered school jackets for both men and women. 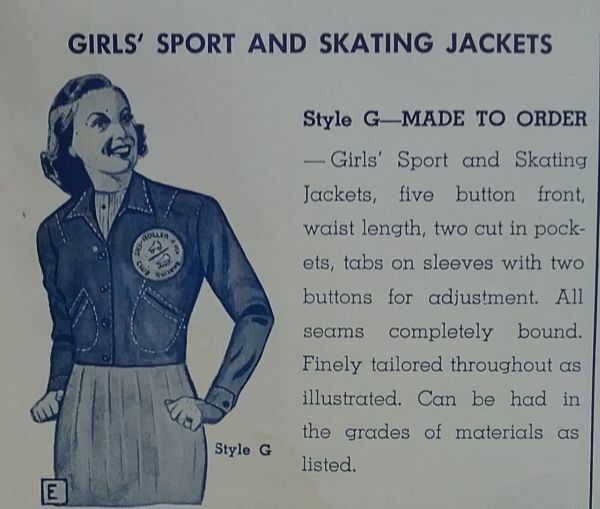 By the 1940s the standard raglan sleeve “letter jacket” was already available for men, but they also had more stylish offerings for both men and women. 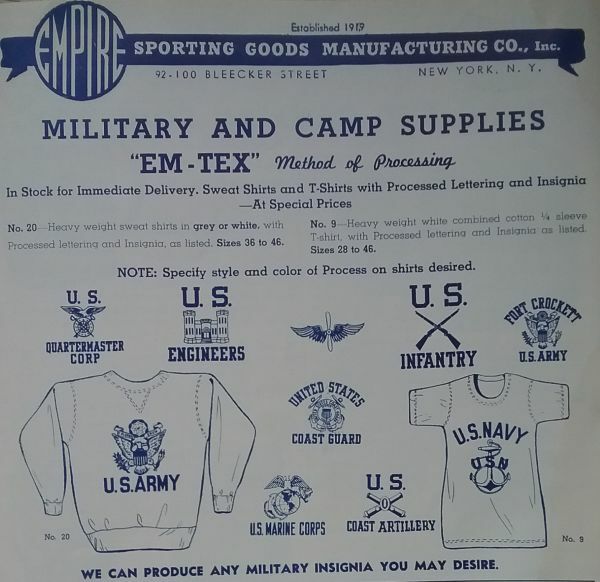 And because this catalog must have gone to press just as the USA was entering WWII, there were all sorts of military logoed items available. I’ve got to wonder if these were actually ordered by the military, or if they were available to just anyone. It seems like I’ve been on a real nautical kick lately, as the last three items I’ve added to my collection were inspired by the sea. It’s not surprising, really, as sportswear has from its very early days been influenced by clothing traditionally worn at and on the ocean. Garments like the middy blouse were based on the sailor’s middy, and nautical motifs are really common in sports clothing. 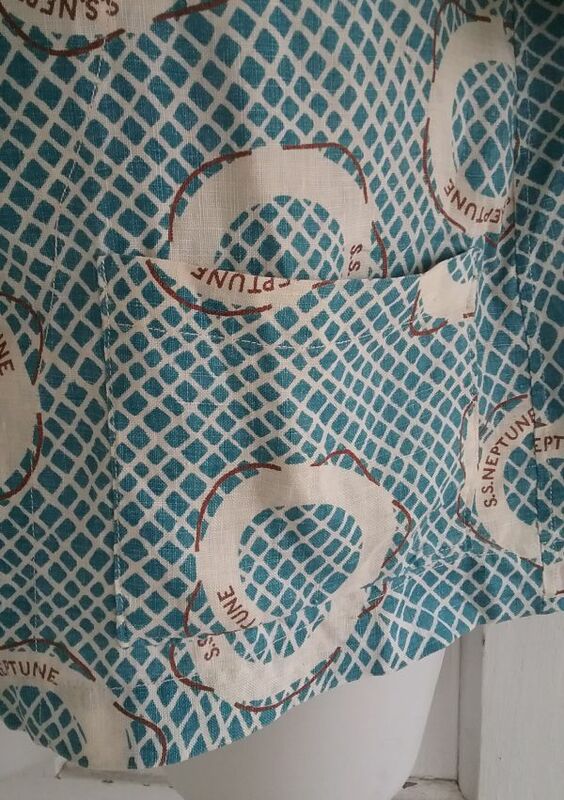 Today’s nautical garment is a top from the post-war 1940s. 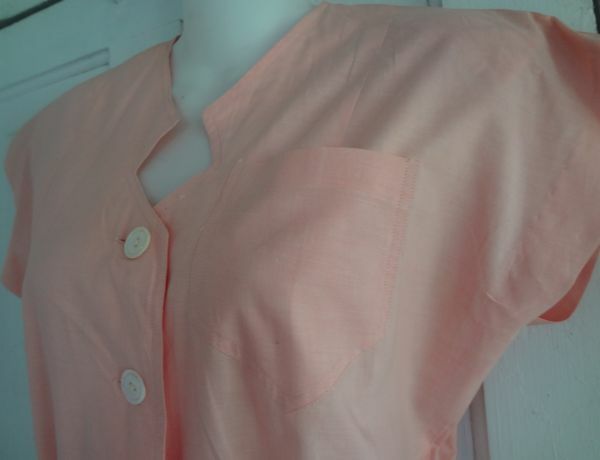 The fabric is linen, and is nice and crisp. 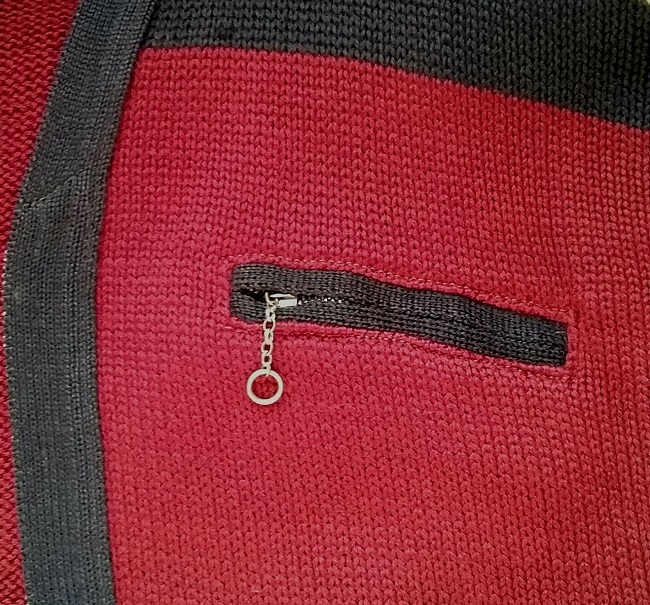 I’ve spent a lot of time thinking about this top, and its original purpose. At first I thought it might be a beach cover-up, but the length seems a little short for that use. 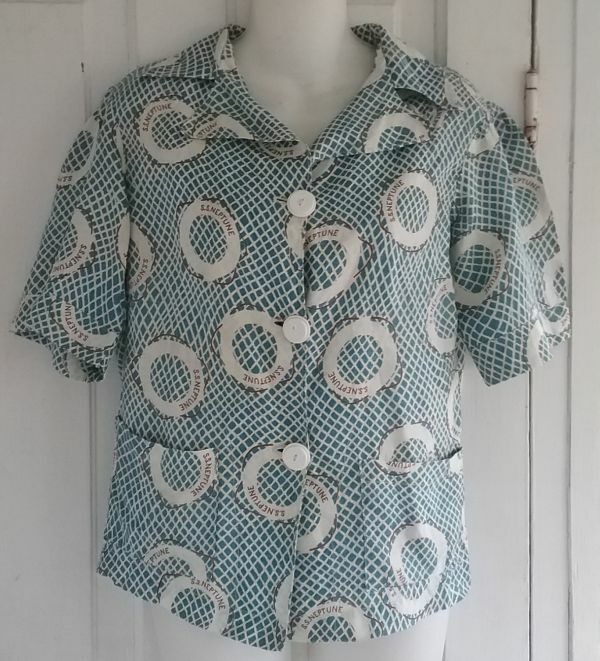 The presence of the pockets, and the fact that there are only three buttons keeps this from being a blouse that would tuck into pants or shorts. So I’m going with jacket. 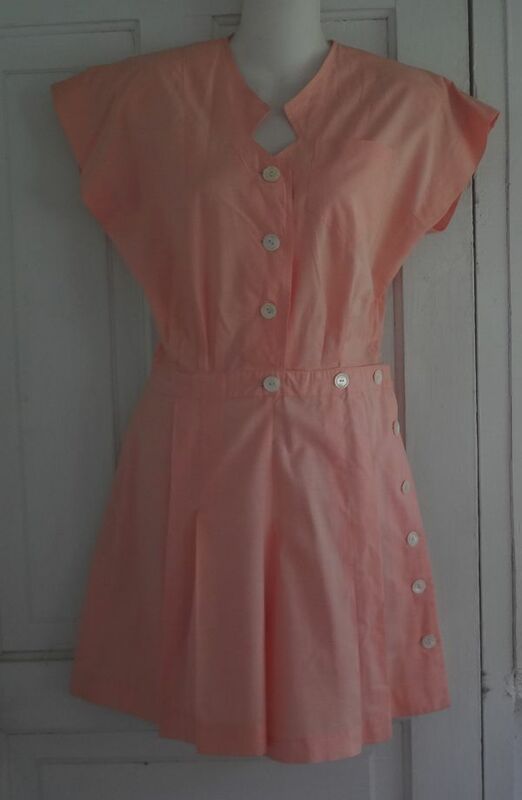 I can see this paired with a pair of white slacks, with maybe a tee shirt or halter top beneath. 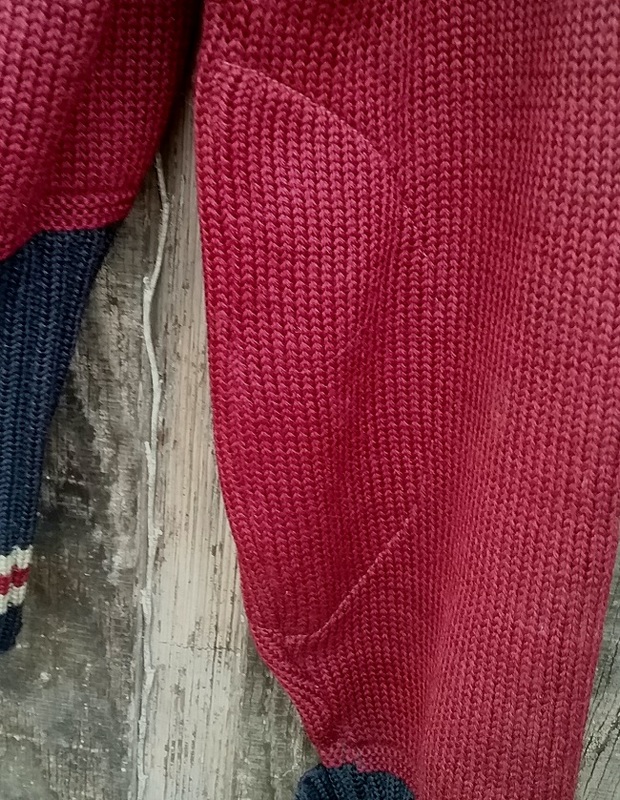 I love the colors, which are not the standard nautical red, white, and navy. 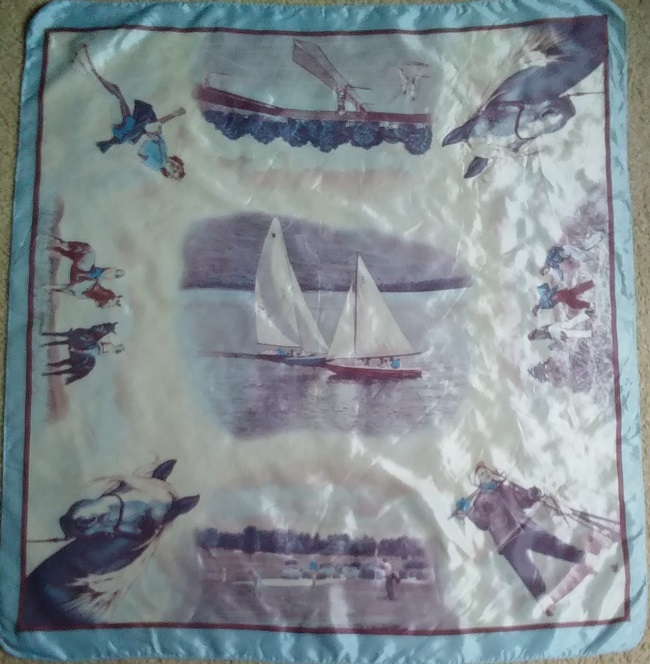 The rope around the life preserver is the very same color as a sash on a late 40s pants set I have. 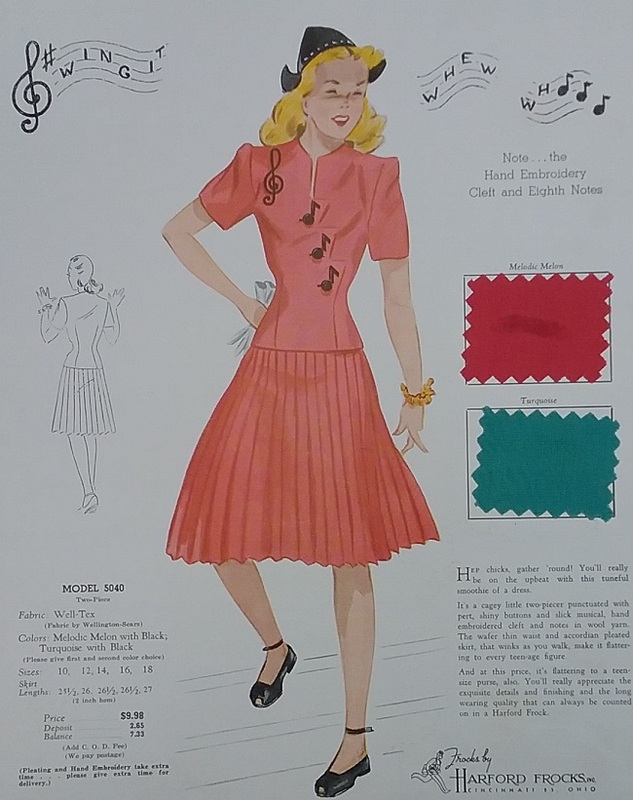 Color is fascinating, because you really can use it to help with the dating of garments. 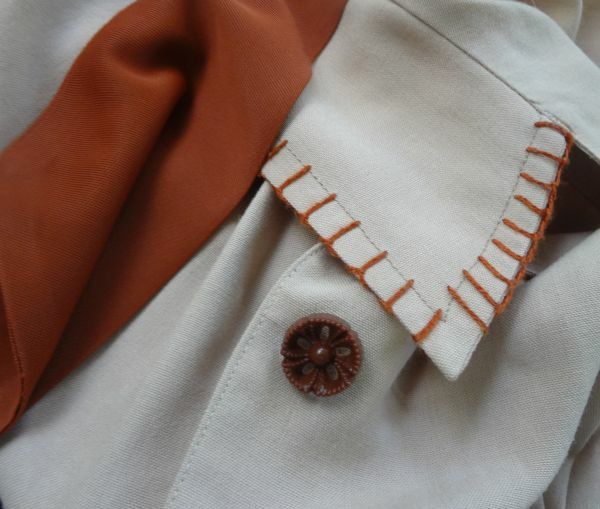 At first I could not decide if the buttons were the originals, but a very close inspection of the thread used in the making of the buttonholes, and the thread used to sew on the buttons seems to be a match. So I’m pretty sure they are the originals. And you can tell by the handmade button holes that the jacket was made by a home sewer, rather than manufactured commercially. The sewer knew her (or his, possibly…) fabrics and took no chances with the linen. 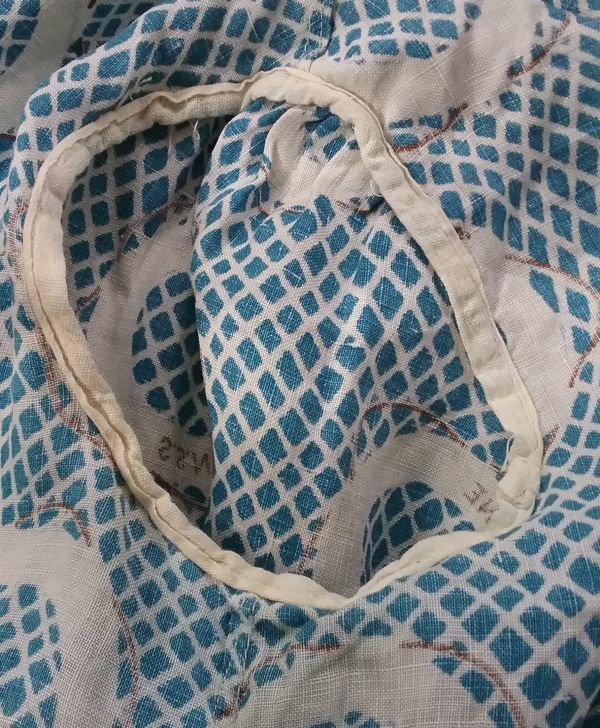 To eliminate raveling, the armscye was bound in bias tape, and the seams were flat felled. 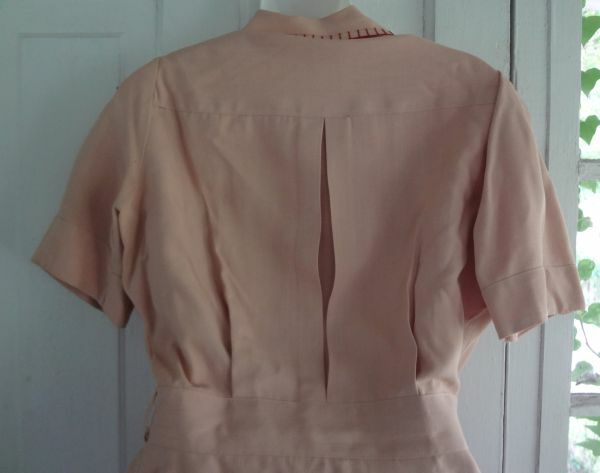 There are no exposed edges anywhere on the garment. I looked to see if there was any special SS Neptune, and found a lot of photos of a sailing ship caught in the arctic ice. 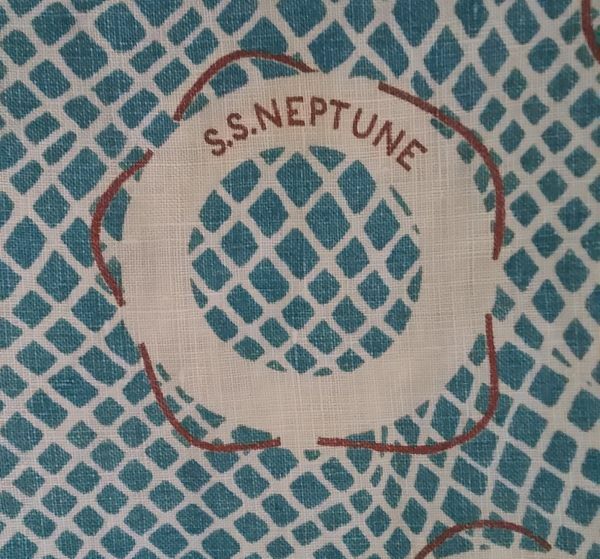 There have been lots of ships named Neptune, for obvious reasons, and I guess this print was named not for a real ship, but for an imaginary Neptune.